Judah Ben-Hur (Charlton Heston) is the leading member of one of the most prominent Jewish families in the Roman province of Judea. When his childhood best friend Messala (Stephen Boyd) returns after years spent living in Rome, Judah hopes their closeness will resume but Messala is a changed man, a Roman Tribune who has nothing but the Empire in his veins. He wants Judah to betray his people but turning informant on anyone who us set against Roman rule. He refuses and after loose roof tiles smash near to the horse of the new Governor, nearly killing him, Messala vindictively jails his mother and daughter and condemns Judah to a life as a slave, rowing in the bowls of a galley ship forever. But destiny has a different idea and Judah will live many different lives before he can return home. 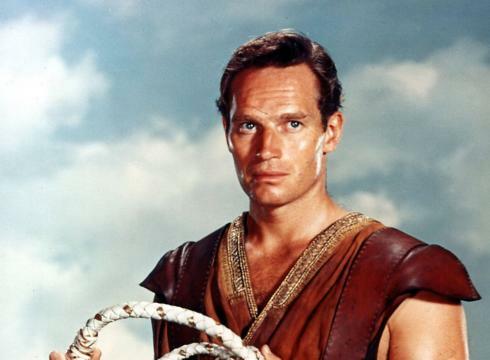 It’s a strange destiny that brought me to a new life… (Charlton Heston, as Judah Ben-Hur). I’ve always preferred epic over intimate cinema. It’s not just the sumptuous costumes and photography or the grand political scheming set against mankind’s eternal struggle for equality. Not even the boomingly melodramatic acting from Hollywood heavyweights trying to out scale the vast and opulent production design. But you just get more for your ticket price with ‘DeMillian cinema’. 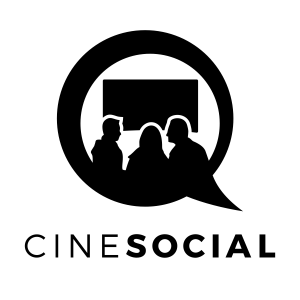 Think about it: your average film runs for about 1 hour and a half and you pay, on average, £8 for a seat. By the time you buy/collect your ticket, sort the popcorn and drinks out and get seated, you’ve spent longer queuing than actually doing what you went to the cinema to do. With epic cinema, you get twice the film duration and ten times the spectacle for the same price. You don’t even have to rush consuming all the food and drink in time before you leave. Now, in a time of austerity, I can’t think of better value for money. Back in 1959 MGM obviously had more cash in the corporate coffers to be bothered with such trifling matters as being cost effective. They could afford to be more reckless with the dough, investing a then astronomical sum of $15 million to make doubly sure the mammoth sets, animals, crowds of people and other epic paraphenalia were all present and correct. But then with a three hour 42 minute running time, this was the biggest of canvases to fill. Literally everything about Ben-Hur is big – even the overture lasts more than six minutes. And how decadent and privileged does one feel to watch a film where the composer’s work washes over us and helps sets the scene as we seat ourselves. For this monumental, imperialistic work, we have composer Miklos Rozsa to thank. And yes he won an Oscar for it (his third of three). Big, bigger, biggest – the famous Chariot race arena set. One thing that isn’t too vast is the camera set-up chosen. Rather than using a widescreen format that was standard for a film like this at the time, Wyler and cinematographer Robert Surtees (Another Oscar? You betcha!) instead developed lenses which recorded as much of the action as possible but on the standard celluloid film size. Despite the massive scale of the film, the actors are never dwarfed by them and the screen always appears full and balanced. Screenwriter Karl Tunberg is the only credited scribe on a script that also numbered Sam Behrman and novelist Gore Vidal at various points. The production team made a fine job of marrying the myriad styles and themes into a lucid and delicately nuanced piece of writing. One thing that always impresses me about Ben-Hur (and I’ve seen it about half a dozen times) is the sensitivity and emotion that it contains. It plays throughout with the theme of destiny and outcome: Messala’s friendly boyhood pal turns out to be a vindictive adult who gets a perverse joy out of torturing his former adoptive family. Judah goes from being a Prince of a fine house to a galley slave and then a Roman charioteer. Miriam and Tirzah’s clean and noble women degrade into sickly lepers whilst swooningly romantic Esther spends years in self-imposed loneliness and isolation. The script, with crisp and poetic dialogue, helps make this the most intelligent and thoughtful of epic films until Gladiator (2000). Heston scooped his only Best Actor Oscar for an appropriately pitched display of teeth-gnashing, stern eyed, angst and integrity. No other character has suffered so much on the big screen and for so long; externally he becomes ever more Christ like during his time in the galleys, with unkempt beard, long hair and introspective, philosophical speeches. It isn’t the best performance in the film, but it has that thump of purposeful impact to it, as if the performer wants you to remember them. Whipping the audience into a frenzy…Charlton Heston as (Judah) ‘Ben-Hur’. Of the other actors, Welsh actor Griffith won the Best Support Oscar for his turn as the friendly Sheikh who encourages Judah to race chariots against the Romans in an obvious display of defiance. To modern eyes it might be distasteful to see a white actor ‘blacked up’, but this is an enjoyable, congenial turn as he slaps the buttocks of his servants and wipes his hands on their clothes. Women usually have saintly, motherly roles in epic movies, but what material they have they run with: Harriet’s solemnity and loyalty, O’Donnell’s (her last film role) perky, teenage puppy love for Messala and Scott’s reasonable, pure mothering. For me, Boyd was the cinematic discovery of the year. Handsome and a wonderful performer he revels in the snarling, full-on matinee idol villainy of the role. In the year of Cecil B DeMille‘s death, perhaps Wyler wanted to one-up the recently departed main man of epic cinema. Where DeMille’s epics could be preachy and stilted, Wyler’s has the subtle approach. This benefits such a long film, because after the heart-racing action sequences you are not brought to an abrupt stop for a conversation to take place. I prefer his even-keel approach. It also means that the mighty chariot racing sequence has maximum impact. Lasting 18 minutes, of which Wyler directed only the introductory pageant, it still retains its awesome power of spectacle nearly 60 years later (although, the 1926 version is still just as exciting). Wyler also sorts out the tricky issue about how to represent a spiritual presence as Jesus in the cinema. The 1926 Fred Niblo version rather clunkily showed only Jesus’ hand or arm; Wyler just shoots his actor from behind, with assembled extras looking appropriately awe struck. 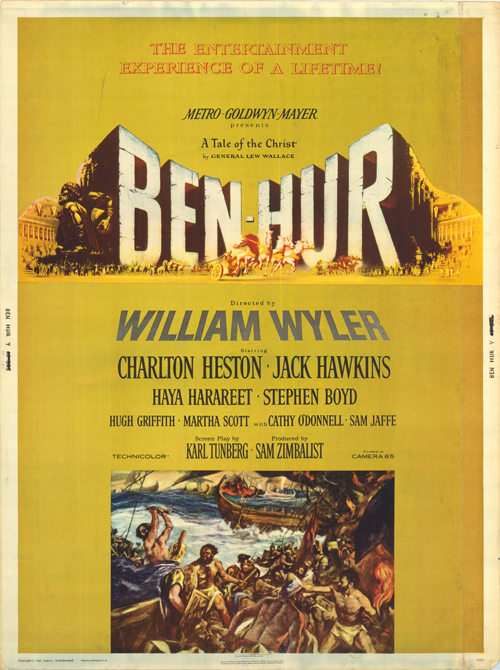 The film dips a tad after the adrenaline injection that is the chariot race (there is still about an hour of the movie to go) and Wyler becomes consumed as other epic directors do with scenes of almost continual marching. At one point, we see the bloodied feet of slaves on an epic preambulation; I’m not sure whether this symbolically represents Judah’s progression throughout the film, or the audience who accompany him on such an arduous journey. But Wyler keeps the pace going tremendously throughout. The film is constantly gripping and dramatically rewarding; now that really is good value for money. Director: William Wyler. 212 mins. MGM. (PG). Charlton Heston, Stephen Boyd, Haya Harareet, Jack Hawkins, Hugh Griffith, Martha Scott, Cathy O”Donnell, Sam Jaffe, Finlay Currie, Frank Thring, Terence Longdon, George Relph.